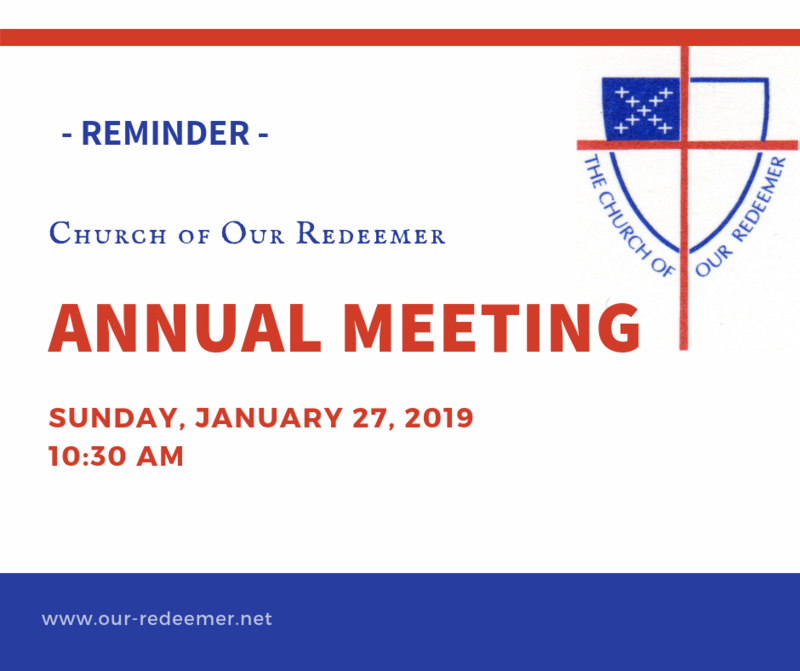 Sunday, January 27 will be the Annual Meeting of the Church of Our Redeemer. All parish members are encouraged to attend and let their vote and voice be heard at this important yearly gathering. We will elect new vestry members, officers, and deanery delegates as well as next year’s nominating committee. Your vestry will share what we’ve done this year and we’ll get your ideas and input for the year to come. We will also enjoy a slide show of the past year in the life of our parish family (thank you, Randy Bowlby!) and a pot-luck brunch together. So that we can all be together, there will be no 8am service that day. There will also be no formation classes for children or youth. Youth are encouraged to take part in the Annual Meeting. There will be a separate program for children. Please bring a brunch dish, salad, dessert, etc, to share.